Legendary baseball pitcher Nolan Ryan turns 66 today. Nolan Ryan pitched a record 27 seasons in the major leagues 1966, 1968-93. He was a freak. We will never see another Ryan. This doesn’t mean he was the greatest pitcher of his time. He wasn’t even close to that but the longevity and records he set will likely never be broken. Ryan pitched for four teams in his career,the New York Mets, California Angels, Houston Astros and Texas Rangers. He was inducted into the Baseball Hall of Fame in his first year of eligibility 1999. Nolan Ryan pitched a record seven no-hitters. Sandy Koufax is second on that list with four. Nolan is tied with Bob Feller for the most 1 hitters with 12. 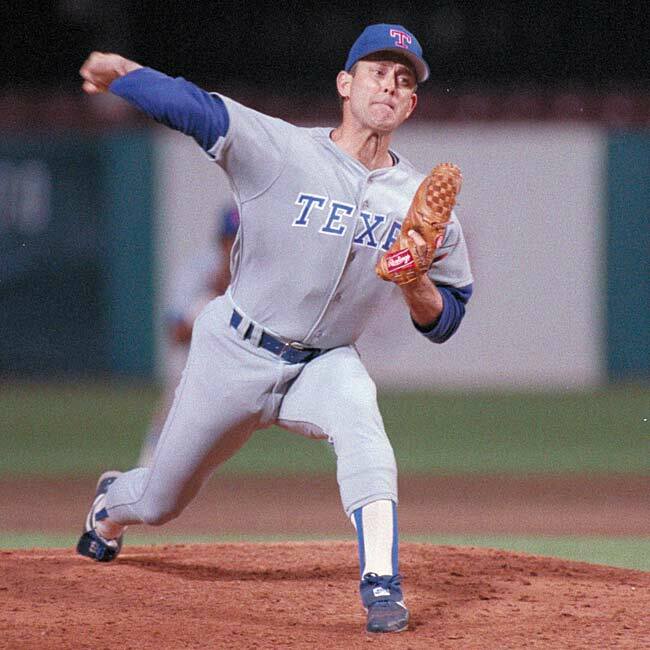 Nolan Ryan was throwing over 100 miles an hour into his 40’s. His 5714 career strikeouts leads everyone in baseball history by a significant margin. He has 839 more strikeouts than runner-up Randy “Big Unit” Johnson. Nolan Ryan and Sandy Koufax are the only pitchers in the Baseball Hall of Fame who have more strikeouts than innings pitched. Nolan also has the most walks ever by a pitcher with 2795 which is 962 more than second place Steve “Lefty” Carlton. Nolan Ryan’s career record was 324-292 with an ERA of 3.19. He never won a Cy Young Award. He was an All-Star 8 times. He won 20 games twice. One major criticism of Ryan was that for most of his career he didn’t pitch ‘smart.’ Ryan would challange a fast ball hitter in a critical situation with his fastball. Sometimes he won that battle other times he didn’t. The thinking was also he was wanting strikeouts not just outs. He really became a complete pitcher late in his career with the Rangers. I was lucky enough to see Ryan pitch a number of times. He was one of those rare pitchers who if he was pitching you made a special effort to go and see him pitch. He was a marvel.